Haptic controls: No amount of photos can make them look good. Try it out, though: It’s a little bit like magic. If you look closely, you can see the Leap Motion that’s being used for the hand tracking. The haptic feedback comes from the ultrasonic array immediately below the Leap Motion. Since Ultrahaptics was founded in 2013, the company has showed off a string of better and better technical demos. Which has been fun, but obviously where the rubber really hits the road (pun most emphatically intended) is when the products start showing up in the real world. 2017 may just prove to be the year that happens. Cars, perhaps more than in any other market, is where haptic feedback interfaces make the most sense. Car makers love the flexibility of touch screens; it means you don’t have to figure out what every button does and where it goes in the long production cycles of automobiles. You carve out a big slab of space to fit a screen, and the software guys do the rest. Makes sense; this is the exact same approach that means you can use your smartphone for a billion different things, rather than just sending SMS messages, making phone calls and playing snake. There’s a problem with touch screens, though. A big one. You can’t operate them without looking at the screen. Which is a really, really bad idea when you’re barreling down the road at 70 miles per hour in 3,000 lbs worth of steel and glass. Which brings us back to haptic interfaces. 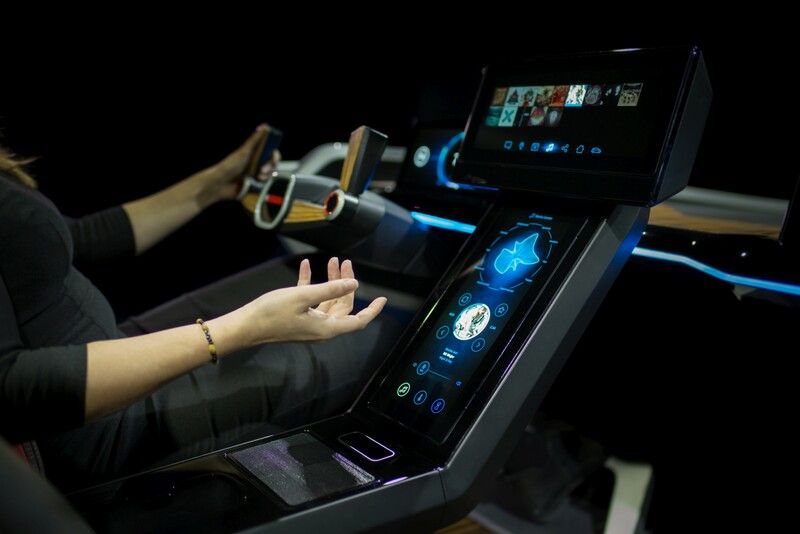 A few weeks ago, BMW showed off the HoloActive haptic interface. It’s part of a concept car that will give you a whiff of what cars might be up to a decade from now, so who knows if that turns up next year, 20 years from now, or, oh, I don’t know, never. That’s the way of concept cars. A much more certain route to market is when large OEM suppliers start showing off technology. 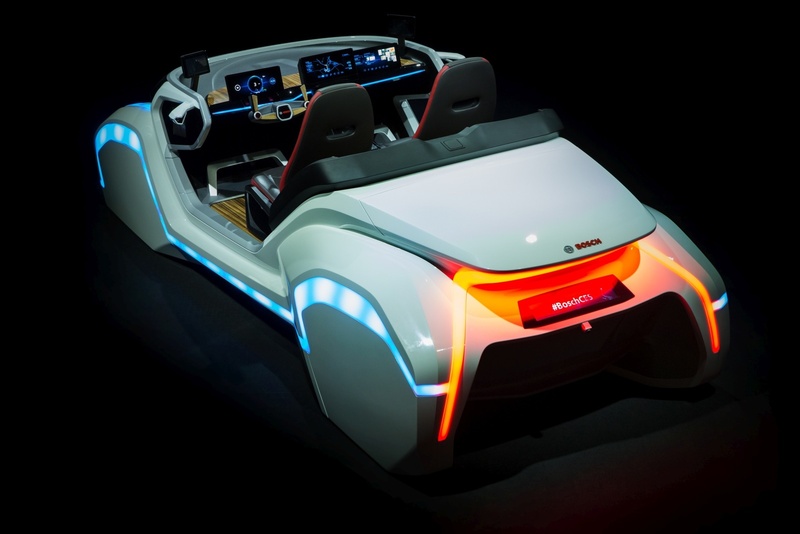 And that’s why a demo car from Bosch caught my attention at CES. It may just be the springboard that will catapult the Bristol-based Ultrahaptics from the relative obscurity of entertaining technical demos, to the shiny, sparkly stratosphere of real-world use. The demonstration of the haptic feedback system at Ultrahaptics’ stand at CES. In the image, you can see the Leap Motion the company is using for tracking. Not pictured: The invisible haptic feedback that’s the actual magic sauce in this setup. If you’re not a car aficionado, it’s possible you only know Bosch for their wiper blades. That’s cool, but whatever the logo on the front of your car, chances are your car contains more than a few parts from the German equipment manufacturer. The company makes all sorts of clever bits and pieces for cars, including ABS systems, electronics, engine injection systems and much more. It’s fair to see Bosch as the over-sized parts bin that car manufacturers pick from when they design their next-generation cars. As part of Bosch’s CES Show Car, the company is showing off two fun new technologies that is making it easier to interact with your car without taking your eyes off the road. One is a production-ready version of neoSense, which is designed to aid drivers touchscreen “buttons” by touch. The second technology is a haptic gesture control system. 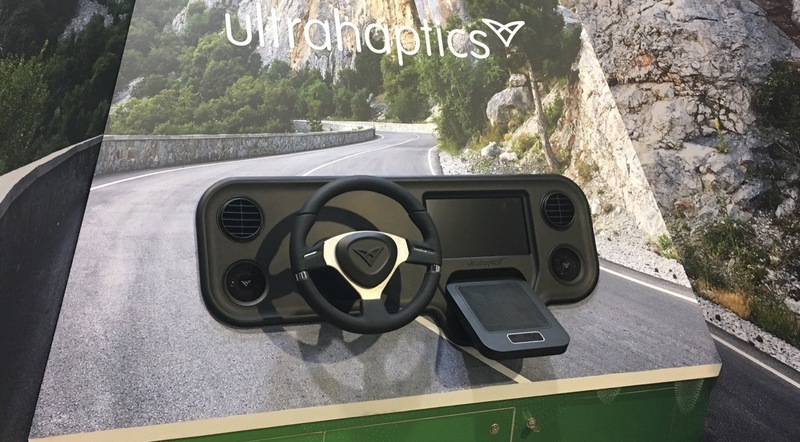 It uses Ultrahaptics’ technology to give feedback to the driver. Instead of having to touch a screen, drivers can simply move their hand in the air. The sensors “see” the hand and by using ultrasound technology, the driver can “feel” the controls. Imagine swiping to the right to skip to the next track of music, for example, and feeling a little ridge in thin air that signifies that you’ve skipped a track. Or, perhaps a better example, moving your hand up until you feel a tingling sensation signifying the air conditioning controls, before swiping left or right to turn the temperature up or down. Both Ultrahaptics and Bosch are extraordinarily tight-lipped about which (if any) car manufacturers are spooling up the use of the technology in cars, but I have it on good authority that we will see this in production cars sooner rather than later. Haptic controls are undoubtedly going to take a bit of getting used to, but if it helps keep drivers’ eyes on the road, I’m all for it. Definitely one to keep an eye out for.